One year ago, local artist Dana Ellyn decided to create paintings of the 2008 candidates and every American president. Her deadline: Inauguration Day. Many of the 37-year-old's paintings riff on presidential trivia. The John Adams painting, "Kissing Cousins," features him puckering up to his wife (and third cousin), Abigail. Ellyn's provocative Sarah Palin portrait shows the former vice presidential nominee juggling fetuses (and caused a ruckus when it was displayed in an Adams Morgan boutique). 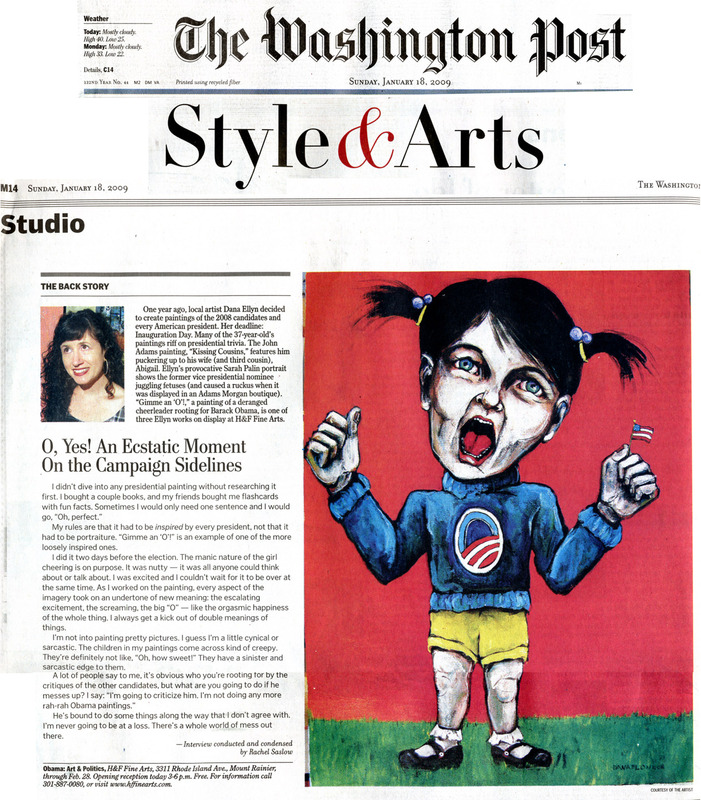 "Gimme an 'O'!," a painting of a deranged cheerleader rooting for Barack Obama, is one of three Ellyn works on display at H&F Fine Arts. I didn't dive into any presidential painting without researching it first. I bought a couple books, and my friends bought me flashcards with fun facts. Sometimes I would only need one sentence and I would go, "Oh, perfect." My rules are that it had to be inspired by every president, not that it had to be portraiture. "Gimme an 'O'!" is an example of one of the more loosely inspired ones. I did it two days before the election. The manic nature of the girl cheering is on purpose. It was nutty -- it was all anyone could think about or talk about. I was excited and I couldn't wait for it to be over at the same time. As I worked on the painting, every aspect of the imagery took on an undertone of new meaning: the escalating excitement, the screaming, the big "O" -- like the orgasmic happiness of the whole thing. I always get a kick out of double meanings of things. I'm not into painting pretty pictures. I guess I'm a little cynical or sarcastic. The children in my paintings come across kind of creepy. They're definitely not like, "Oh, how sweet!" They have a sinister and sarcastic edge to them. A lot of people say to me, it's obvious who you're rooting for by the critiques of the other candidates, but what are you going to do if he messes up? I say: "I'm going to criticize him. I'm not doing any more rah-rah Obama paintings." He's bound to do some things along the way that I don't agree with. I'm never going to be at a loss. There's a whole world of mess out there. Opening reception Sunday January 18th 3-6 p.m.
For information call 301-887-0080, or visit http://www.hffinearts.com.